As everyone in my family gets older, it gets harder to find thoughtful gifts for everyone. Mainly it’s because if there’s something we want, we just go out and buy it. Well I found a few items that not everyone in my family has thought of. 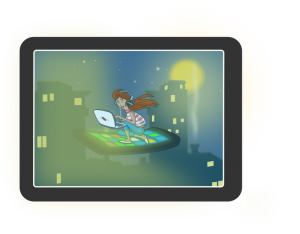 I’m talking about, gift ideas for tablet users. 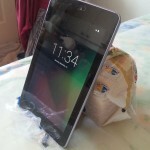 Screen Protectors: As a tablet owner, there’s one accessory that I cannot do without; a screen protector. I find that it gives me a piece of mind when I have a screen protector on my tablet, even if the latest technology promises tougher and more durable screens to prevent scratches. Ever notice that on most devices that ship out, they still cover the screen in a protective film? So until manufacturers are confident they can ship them without the film, I’m going to continue using screen protectors . It just might prevent huge repair bills. Stylus Pens: There are periods when using a tablet, my fingers just feel too big to hit the right hot/tap spots. Either they’re obscured by my hand, or the developer didn’t do enough testing. Sometimes we don’t have a choice in using an alternative app. So for those occasions, I use a stylus pen. If you get one for yourself, I suggest in getting an inexpensive model just to try them out. It also makes a nice gift idea. Bread as a tablet stand. Tablet Stands: In the morning, I read my local newspaper on my tablet. So this means I can’t always be holding it while I eat my breakfast. (Terrible manners, I know.) Sure, I could always lean the tablet against something, (like a loaf of bread) however, since I don’t live alone, the items I use are usually needed by someone else. So rather on being interrupted, I got one of these tablet stands . It works with most tablets and smartphones in either portrait or landscape orientation. I also like that it’s small and portable. It packs up nicely in my backpack. Bluetooth Keyboards: There are times where I don’t feel like bringing my laptop with me when I go to meetings. This is especially true when all I need to do is take notes. As an alternative, I use my tablet with Google Docs. However, using the onscreen keyboard when taking notes on a tablet or smartphone can be a bit annoying in that it takes up screen space. One solution is a portable bluetooth keyboard. 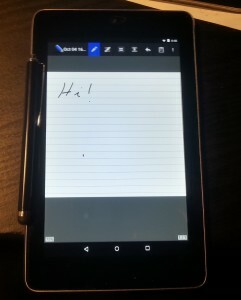 Once it’s paired up with my device, it feels like a mini notebook. What I like about having a portable keyboard is that I can pair it up with any device that uses bluetooth. Tablet Cases: Another accessory that I can’t do without is a tablet case. I feel it’s another layer of protection when I shove it in my bag. However, why just go for an ordinary case? How about something that combines the previous two items I mentioned? I’m talking about a keyboard stand case . It’s three items in one! The case offers another layer of protection and there’s a built in stand so that I can use the bluetooth keyboard. Like the tablet, the keyboard is rechargeable through a USB cable. I hope I was able to provide you with a few good gift ideas for tablet users. I should mention that for some of the items, it’s important to know the model of the tablet. You don’t want to end up getting the wrong screen protector or tablet case for the wrong model. If you have any other gift ideas for a tablet user, feel free to leave a comment at the bottom of this page. Look for more gift ideas on Amazon.com or Amazon.ca !